If you are looking for a portable vehicle in the form or an electric scooter to take you the last mile to work or just for fun.You might be interested in a new scooter called the ion SmartScooter which has been designed to provide users with the ultimate commuter electric scooter. The ion SmartScooter has been designed and created by Probity Cell to a prototype stage , equipped with a battery that is capable of being charged from flat in just 3.25 hours and has a life-cycle of over 1000 charges and a lifespan of 3 to 5 years. The ion SmartScooter project is currently over on the Kickstarter crowd funding website looking to raise $40,000 in pledges to make the jump from concept to production. To learn more about the ion SmartScooter electric scooter with electronic water resistant controls hidden wiring within the frame, check out the video below. “The ion SmartScooter pairs high-output 36V Lithium-ion batteries with a powerful 250W brushless electric hub motor, and houses them in a sleek, sturdy, aircraft-aluminum standup scooter frame. 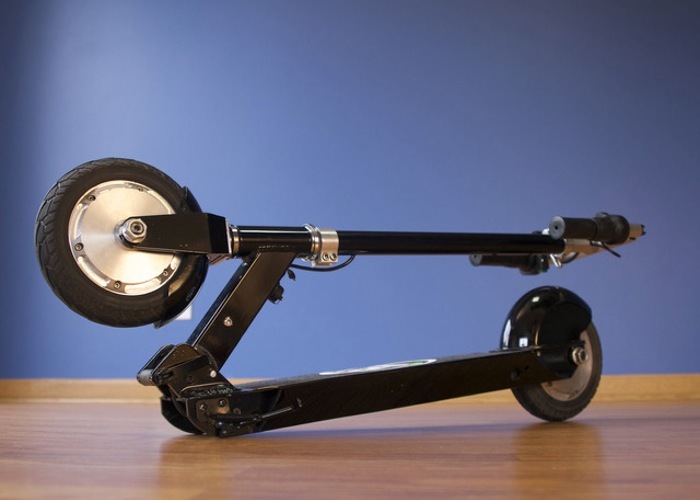 Weighing only 26 pounds, the SmartScooter can be folded in seconds to store in the trunk, carry onto mass transit or store in a closet. Among its many advanced features are smooth-riding, never-flat tires, and an electronic brake located within the hub. So if you think ion SmartScooter is something you could benefit from, visit the Kickstarter website now to make a pledge and help ion SmartScooter become a reality.